David Robinson is one of the most-respected former players in NBA history and also one of the greatest centers of all-time. 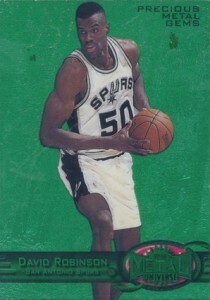 As the face of the San Antonio Spurs during the 1990s, David Robinson cards remain a popular option for collectors. 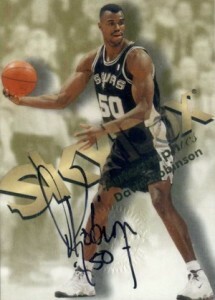 A frequent signer for card products, autographs are some of the top David Robinson cards available and there are many choices for collectors. While some can be found for very reasonable prices, this does not mean they are cheap and the more rare cards can push high in value. The list below highlights ten key cards for David Robinson that span his entire career and into his retirement. 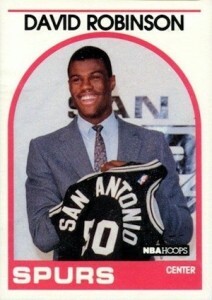 Although drafted by the Spurs as the first pick in 1987, David Robinson's Naval obligations prevented him from joining the team until the 1989-90 season. 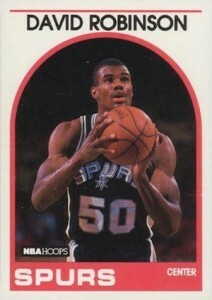 However, collectors in the San Antonio area were treated to an early David Robinson card as part of a giveaway during the 1988-89 season. 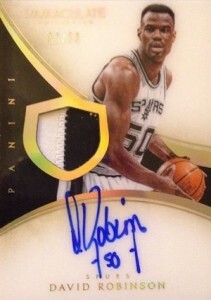 While values mostly remain on the lower side, the colorful card is the very first NBA option for David Robinson. Two versions were issued with one featuring a tear-off tab and the other released without the tab. Other than the tab, the slightly-oversized cards are identical. Notable for several reasons, the 1989-90 NBA Hoops rookie card for David Robinson was a huge deal when it was released. First, it was not common for a first-year player to actually be featured in a product during his rookie season. Also, while the print runs were massive, this card was a short print. Although this card can be had for just a few dollars now, it originally sold for huge amounts and there was even a problem with counterfeits. The card on the left is the official rookie for David Robinson and found in 1989 NBA Hoops Series 1 boxes. The second card is from Series 2 and features an action image of Robinson. 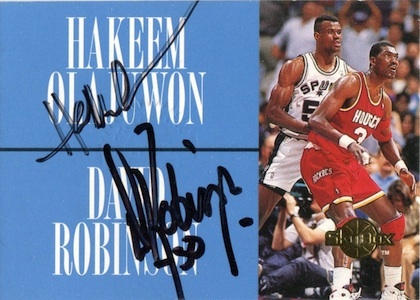 Two of the top big men in the 1990s and in NBA history, Hakeem Olajuwon and David Robinson teamed up on this dual autograph card. Originally issued as a redemption, the card was a very tough pull at 1:15,000 Series 2 packs. 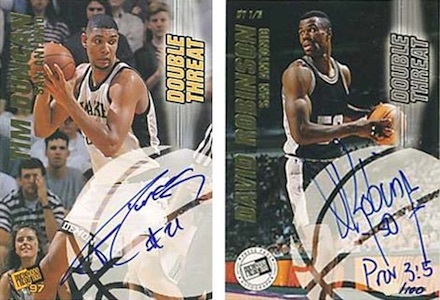 Although Press Pass does not make many top lists for cards, this 1997 Double Threat Autograph remains the only signed card to pair Tim Duncan and David Robinson. Signed on-card and hand-numbered to 100, these rarely surface. One of the best examples of how revered numbered parallels can be, especially for basketball collectors, 1997-98 Metal Universe Precious Metal Gems are a foil-covered treat from a popular collecting period. The David Robinson PMG parallel is numbered to 100 and the total is split between the two color options. The first ten cards are green and the last 90 are red. 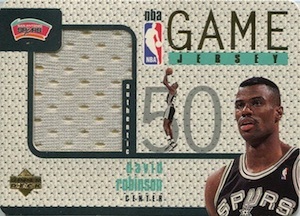 The earliest NBA relic for David Robinson, 1997-98 Game Jersey cards are still popular with collectors despite the simple jersey pieces. While not numbered, the David Robinson jersey cards are quite rare and don't pop up often. 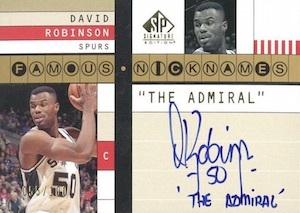 Another classic 1990s insert, the 1998-99 Autographics line included two different signed cards for David Robinson. The more common option is signed in black ink, while the blue ink parallel is hand-numbered to 50. 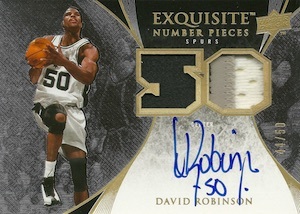 The top high-end brand in collecting for most of the 2000s, Exquisite Collection offers plenty of signed cards for David Robinson and all make a great collecting addition. Low print runs, quality designs and on-card autographs keeps these cads in high demand. 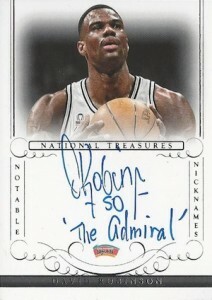 While David Robinson never actually reached the title of Admiral during his time in the Navy, the nickname remained for the stoic giant. 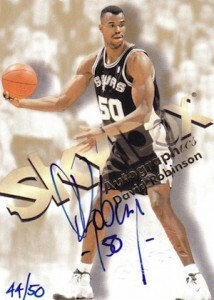 Several different cards celebrate his basketball moniker with an inscription and offer a unique David Robinson collectible. The high-end market has exploded in collecting during the last decade and former greats have been a main focus for several of these brands. 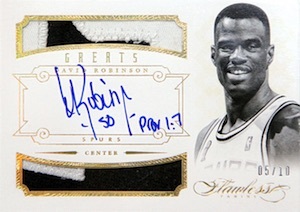 Top autographed relic options for David Robinson can be found in National Treasures, Flawless and Immaculate. David Robinson 🏀DB1 , Nov. 4 1989 . Spurs vs LA Lakers. 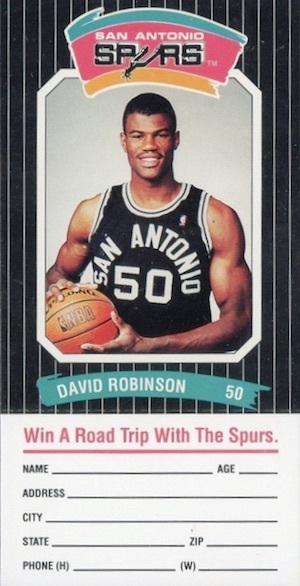 I have a David Robinson Star promo card. Yellow boarder with him playing #43 of the lakers. Can you tell me anything about it? Thanks. Mint in a sleeve. I have a 2001 Essential Credential Now David Robinson card, the back is marked 07/18. Can you tell me anything about this card?